If you are looking for something slightly different with a sophisticated edge then the Ritz Trio jazz band could be just what you are looking for. 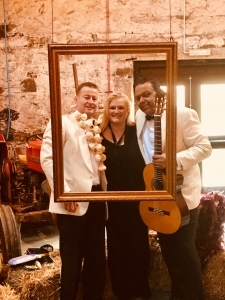 The Ritz Trio have been performing at Kinkell Byre for a number of years and have a great working relationship with owner Sandy Fyfe and the venue team. Lively continental style jazz, classic jazz swing and even the odd more popular tune, will help to create a fun, foot tapping atmosphere. And don’t worry about it being too loud, the Ritz Trio specialise in providing background music all played at a level to enable your guests to enjoy each others company without being too loud. The Trio have been providing first class wedding entertainment at Kinkell Byre for a number of years for during the ceremony or the drinks reception. As the Trio don’t have lots of equipment they are able to easily move from the ceremony to the outside area over looking the lovely sea views , providing perfect music to keep the conversation flowing – guaranteed! They also have an more laid back set ideal for over the meal if required. The Ritz Trio play an extensive list of familiar Jazz standards such as Fly Me To The Moon, Have You Met Miss Jones, LOVE (Nat King Cole), Lets’s Fall In Love, I’m In The Mood For Love as well as a number of well-known Latin tunes such as Sway, Besame Mucho and The Girl From Ipanema. The repertoire also includes a few more well known popular renditions including Music To Watch Girls Go By and Can’t Take My Eyes Off You. Other tunes we are often asked to play include Tonight, Tonight (From Westside Story), It Had To Be You, Air On G String, Here There And Everywhere (Beatles),What A Wonderful World, Moon River and Fly Me To The Moon. We can also make suggestions for a few more contemporary pieces using the violin with the Ritz Trio throughout your ceremony and of course we are always happy to hear your own music ceremony requests!Once the ceremony is over the Trio can quickly and with no fuss move through to “jazz up” the drinks reception celebration!